Hurro! 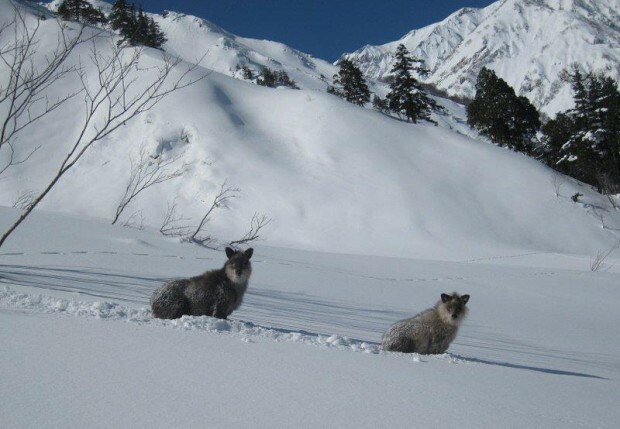 A pair of kamoshikas stare down an intruder in the Japanese Alps. There’s a reason it’s called the backcountry. And though that’s mostly to differentiate it from “frontcountry” — the otherwise nameless, roadbound zone where most of us congregate — the term also connotes at least some promise of wilderness. As such, we’re more than happy to cede it to the wild animals that call it home, which is one of the cool things about getting out there on skis — seeing and understanding what kind of critter makes its home in the winter world. Touring in the Alps you’re likely to glimpse Chamois or Ibex; in North America. Elk, Bighorn Sheep and, if you’re lucky, Mountain Goat. Go somewhere stranger, of course, and you’ll find stranger animals. Like the Kamoshika — denizen of Japan’s mountains. I saw my first Kamoshika on my third trip to Japan and that was the first I’d heard of it. A friend and I were skiing a steep ridge outside Nozawa Onsen ski area when I dropped over a pillow and almost brushed the bizarre creature, known for hanging out beneath cliffs and pillows where edible plants might be exposed. I was shocked by the sudden sight of a furry, boar-sized animal with a bearded face, perky bear-cub ears and small devil’s horns that, when we stopped, proceeded to dolphin through the snow along our tracks, driven toward us by natural curiosity. The Japanese Serow, its English name, was accurately described at the time by my companion Shane Szocs’ riotous moniker of “Pig-sheep-goat-fish-llama-dog.” He well-knew the animal — but only because he was a veteran of poaching in a land notorious for prohibiting any and all off-piste skiing. Many reasons kept Japan’s skiing populace from forsaking its samurai-like dedication to manicured pistes and technical pursuits like racing or bumps for off-piste forays: malevolent forest spirits, ancestral lands, national parks, nature reserves, geothermal hazards, avalanches, general fear, the obsession with rules of an honor-bound society and, above all given this litany, a noted lack of ski patrol and other personnel trained to deal with backcountry traffic and its inevitable accident-train. In addition, a relentless snow machine of cold Siberian winds off the Sea of Japan deposited snow in such vast amounts and with such frequency that it was often too deep to ski; there was, consequently, neither widespread dissemination of powder-skiing style nor anyone to lead the way. Move along folks, keep on the piste — nothing to see here. The author digs in at Nozawa Onsen. What had essentially become a powder police-state began to break down with the snowboarding revolution (though Japan’s single-plank crop were the most polite and least lawless in the world) and continued with the steep-and-deep ethos of the extreme-ski era: global snowsport aficionados discovered Japan’s preternaturally deep and untouched snows. They came, made movies, and disseminated the mind-boggling — though still prohibited — experience around the world. Soon there was demand, and international ski bums, and a few areas permitting this catastrophe if only to ghettoize powder-hungry gaijin. When the Japanese economy went in the tank and outsiders swept in to buy up foundering ski areas, they had one thing on their minds: powder. Adventure-ski tour outfits from Australia, Canada and the U.S. dropped in. When the Big Mountain/freeskiing craze hit all hell broke loose. As authorities slowly relented, the seemingly impossible happened: a new generation of Japanese skiers voted with their feet, skiing mostly at the areas where they were allowed off-piste. According to Tatsuya Tayagaki, editor of the country’s freeskiing journal of record, BravoSki, backcountry skiing in Japan continues to accelerate. “A shrinking ski market makes anything that keeps the industry afloat appealing,” he says “and backcountry travel has also become more a part of Japanese culture.” Indeed hiking is at an all-time height of popularity, with local guides leading trips into Japan’s abundant alpine regions. How unexplored have these areas traditionally been? Well, Japan’s first glacier was only discovered in 2010, a Pleistocene holdover that had somehow remained unidentified. The 800-metre long, 30-metre thick ice-tongue located on 3,003-meter Mount Oyama in the Tateyama Range disproves the received view that glaciers don’t exist in east Asia south of Russia’s Kamchatka Peninsula and has been cause for celebration and visitation. The proliferation of guides and trend for backcountry experiences has bled over into the winter world: “Most summer hiking guides are also winter ski-tour guides,” notes Tayagaki. On recent trips to Japan, at resorts I see ski tourers where once they would never have been found, previously silent woods between designated runs tracked up after storms, and official backcountry gates and attendant warnings everywhere. Skiers and boarders are clearly getting after it. Despite the increased traffic, however, there’s no deterioration of the widespread bounty. With almost 20 metres of snow during an average winter in the Honshu Alps and almost daily snowfall in some areas of Hokkaido, even the Kamoshika aren’t worried about getting crowded out of the Japanese backcountry — which, it seems, is still very much a place of adventure and discovery.